Hello! It’s a chilly day for quilt photos today let me tell you! Minus 20 Celsius. And since one cannot properly operate a camera in Kombi gloves (the warmest gloves I’ve ever owned) my little fingers, especially the pinkies, were quite frozen after only a few minutes. Luckily I got some good shots in the five minutes my husband and I were outside! So here is a finish I have been looking forward to! My Pixel Heart in a Pixel Heart quilt. I got the idea for this after seeing this Pixel Apple quilt on Pinterest. Update: There have been several request for a pattern so I have written one. You can find it on my site here. If you are an EU (European Union) buyer please purchase on Etsy due to VAT tax. This pattern has been priced at $10.00 Canadian. (That’s about $7.00 US) You can also find this pattern in my Craftsy Pattern shop. I love it when a plan comes together! I design this I first drew a pixel heart on graph paper by copying other pixel hearts I found on Pinterest. I used the Quilter’s Planner graph paper and each square was drawn over four squares. Then I drew the smaller pixel heart inside the big hear. Each square on the graph paper represented a 2″ finished square so the larger squares that were drawn over four squares represented a 4″ finished square. Does that make sense? I then just counted all the smaller squares I needed to cut for both black and red fabrics and all the larger squares I needed to cut for the red and cream fabrics and got busy cutting. This is a Valentine’s Day Quilt for my Etsy shop but would also be a great gift for a musician because there are two sheet music fabrics in the background fabrics and some music symbols in the black fabrics. I love the text fabrics in the black. There’s a Carolyn Friedlander Architectextures (is that the right name? I’m forgetting) in there and a newsprint text all about quilting terms. Here’s a close-up of the background fabrics and the binding. The binding is the Handmade Stripe from Bonnie & Camille’s Handmade line for Moda. I bought it from Country Clothesline in her Boxing Day sale but it’s sold out now. The backing is Petite Henna Garden in pink that I bought from Studio 39 Fabrics in her Boxing Day sale and she still has it on sale for $10 CDN a metre. 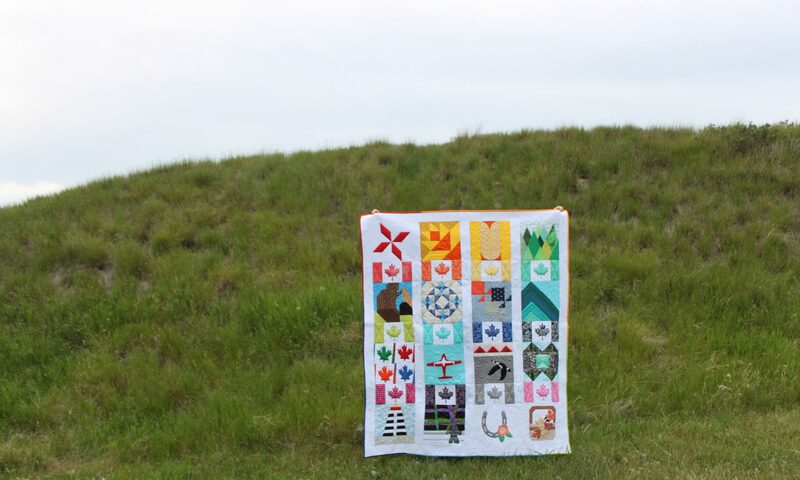 I want to get another quilt back in green! Close-up of the backing and binding. I love how the binding looks like a barber shop pole. This quilt is for sale here.